Acupuncture and FDN use similar needles, but they are very different in the application and goals of treatment. Acupuncture is based on ancient theories of traditional Chinese medicine and uses insertion points all over the body based on meridians and focuses on balancing energy or Qi in the body. Dry needling in physical therapy practice is based on Western neuroanatomy and the musculoskeletal systems to provide treatment of acute and chronic pain, as well as treatment of orthopedic and sports-related injuries. Both FDN and Acupuncture do, however, use the same tool: a solid needle filament. Needles used with FDN are not the same ones that your doctors/nurses use for injections. They are typically much smaller and “wispy” in nature which renders them more comfortable. Also, FDN uses a needle with a rounded tip that is distinctly different than the beveled, cutting-edge tip of hypodermic needles. Muscles that are sensitive, have active “trigger points” (*see below) or that are tight may feel a slight cramping sensation or muscle twitch when the needle is inserted. *Trigger Point is a hyperirritable point in a muscle that is associated with a hypersensitive palpable nodule, or “knot”. This area becomes painful at the site and can also “radiate” in other patterns. 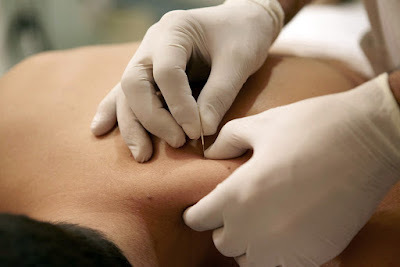 What are some conditions that Dry Needling can be used to treat? Neck/back pain, tendinitis, muscle spasms, “sciatica”, hip/knee pain, muscle strains, “tennis/golfer’s elbow”, overuse injuries, tightness in your neck and shoulders, tight muscles. What are the risks with Dry Needling? Some individuals experience a little bruising or minimal bleeding at the insertion site of the needle. Some report a feeling of achiness or soreness for a few hours after the treatment session. All of these are completely normal. While risks associated with dry needling are minimal, a conscientious dry needling practitioner will be well-versed in precautions, contraindications, and potential complications associated with dry needling. There are certain areas of the body that require more caution than others, but will always be discussed during your initial consultation to determine if FDN will even be beneficial to you. Is FDN covered by insurance? In most cases, it is a fee or cash-based service.